I was gonna write my next preview about the two versions of the Three Storms, but I don't have time to tackle that topic today. 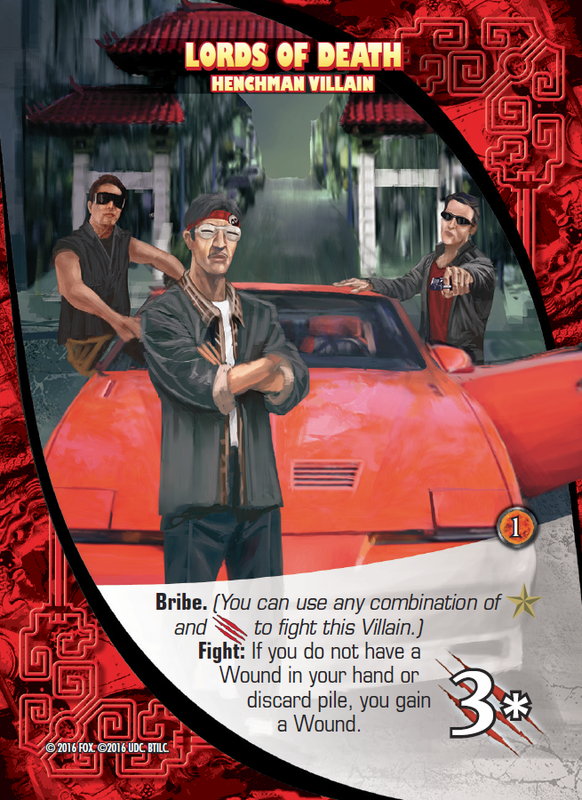 Instead, here's a henchman. The Lords of Death seem like a bunch of low-lifes with awesome sunglasses, but nobody ever wants to tangle with them. In the movie it's always, "Ooh, Lords of Death. Don't wanna mess with them." So I tried to capture that with the game mechanics. You can beat the Lords of Death. Heck, anyone can beat the Lords of Death. But if you're not already hurting, you're going to be hurting. Of course, once you've taken out one, you should just keep on going, because you're not going to be hurt any worse . . . until you shuffle your cards and the Wound gets buried in your deck. 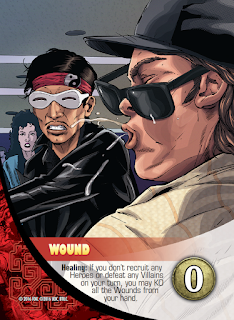 As a bonus, Upper Deck followed through with the Lords of Death sucker punch on the game's Wound card!